Kellogg Community College’s Sacred Music Certificate Program will celebrate Black History Month by hosting a Community-wide Hymn & Spiritual Sing-Along in February. The event, which is free and open to the public, will begin promptly at 3 p.m. Sunday, Feb. 3, in the Davidson Visual and Performing Arts Center Auditorium on KCC’s campus at 450 North Ave. in Battle Creek. A freewill offering will be collected to support future music initiatives at the College. 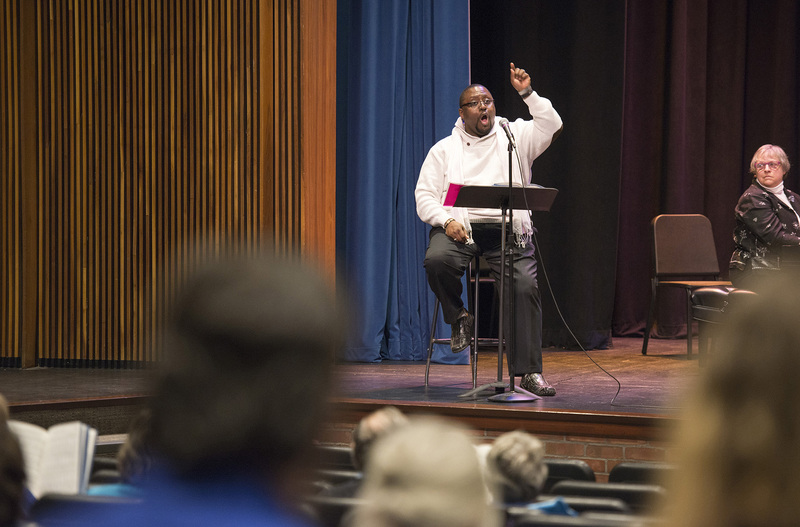 The Sing-Along event will be conducted by KCC Vocal Arts Director Dr. Gerald Case-Blanchard, pictured above, who will lead the audience in singing traditional Christian hymns and African-American spirituals favored across a variety of denominations. KCC faculty pianists Nancy Brown and Kathy Cary will accompany on the piano in addition to performing special music. The event is one of more than half a dozen major community events taking place during the month of February at KCC to celebrate Black History Month, which include a dance class, live musical performances, the College’s annual Soul Food Lunch and more. For more information about the Community-wide Hymn & Spiritual Sing-Along, contact KCC’s Arts and Communication Department at 269-965-4126. For more information about additional Black History Month events at KCC, click here or contact KCC’s Student Life office at 269-565-2634 or studentlife@kellogg.edu. KCC’s Community-wide Hymn & Spiritual Sing-Along is one of several music events and initiatives hosted by KCC students and faculty each year that tie into music programming at the College, which includes a Sacred Music Certificate Program. Students who complete KCC’s Sacred Music Certificate Program are equipped with the skills and knowledge necessary to serve as a church choir director, music worship leader or youth music leader. The program can also help current choir directors from non-choral backgrounds enhance their job performance and satisfaction. For more information about KCC’s Sacred Music Certificate Program and other music credentials offered at KCC, visit www.kellogg.edu/music.